Manufacturer Name: Fitness Technologies Inc.
"Sound quality is excellent with a nice full bass..." US Master Swimming Official Publication. 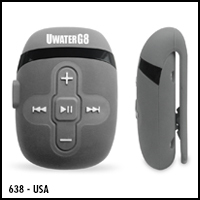 The UwaterG8 clips onto goggles or fastens onto headband, armband, or belt for swim-anywhere, go-anywhere listening pleasure. End the boredom of lap swimming or just enjoy the novelty of hearing music and audio books in the water, on the beach, while surfing, scuba diving, skiing, sailing, exercising showering, outdoors walking, running, any activity! 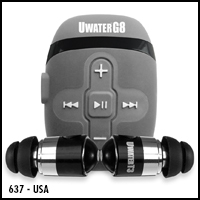 The UwaterG8 audio is tuned to cut through the noise of splashing water and bring you only the purity of ultra-clear stereo sound. Our newly designed single port system (audio, data, charge) is 100% waterproof with or without the earphones connected. With 8GB memory, the UwaterG8 has a 2,000 to 2,400 Songs/20 Audio Books capacity with a continuous play time of 8 hours on a single charge of its built-in high performance (1000+ cycle) Lithium-Ion rechargeable battery. The UwaterG8 weighs a mere one ounce, has Shuffle & Normal playback modes, plus a superb built in multi LED indication panel. System is compliant with Windows 8, 7, XP, 2000, Vista, iTunes, MAC 9.0 & Higher. The G8 comes with short earphones and buds perfect for head mounting while lap swimming. Extension cord is also available. The G8 also sports 3D Control Buttons easily accessed using one finger making adjustments while swimming extremely simple. We also installed a NEW elastic clip engineered to never break. Since 1996 our Waterproof Audio Technologies (WAT) and our UWATER brand have been featured in the New York Times, LA Times, Men's Health (Europe), Swim World, Fitness Swimmer, Triathlete Magazine, CNET, CBS TV, as well as hundreds of other national and international publications. 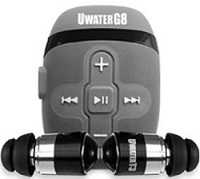 Get the G8 Action iPod Player and we will also include our new UwaterT3 Dynamic Buds (Flat anti-twist cord) - a $30 value - ABSOLUTELY FREE! Just add the G8 to your Shopping Cart and the FREE gift will be automatically added at no additional cost. Play Time: Continuous 8 HRS. Mini size, light weight (under 1 Ounce). Highly Visible Multi LED Panel. Easy downloading from your iTunes library. FREE BONUS GIFT - see above. Beware of cheap imitations. They won't last beyond your first lap. Since 1996 our engineers have invested years of R&D on improving Waterproof Audio Technologies (WAT), optimizing in-the-water audio reception, tuning and controls. Make sure that your Action Gear is one of our UWATER trademarked products available here and authorized dealers world wide.